There’s a great leaf debate happening. One side says that fallen leaves left alone become important habitat for butterflies, salamanders, earthworms and other creatures that are important to our ecosystem. The other side makes the case that matted leaves shade and kill lawns and ground covers, and rot perennial plants. So which side is right? The answer depends on a person’s values, time, resources and aesthetic taste. Our answer is biased, of course, since we offer leaf clean-up services, which are included in all of our full service maintenance contracts. Listed below are a few good reasons why it makes sense to get rid of fallen leaves. Fall leaves form a dense mat that allows water to gather around the crowns of perennials, causing them to rot. If they don’t rot, chances are likely that they’ll come up thinner and leggier the following spring. 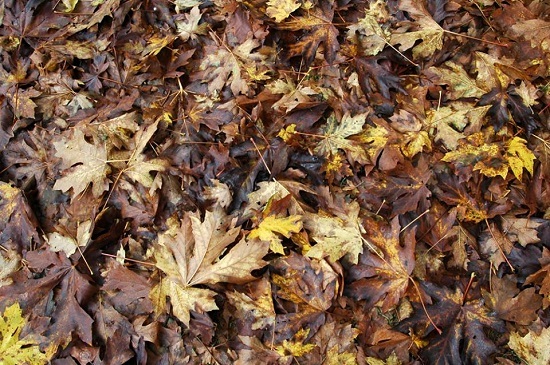 Fall leaves smother lawn and ground cover by denying necessary oxygen to roots. Air circulation is necessary for your lawn to remain healthy year-round. In a matter of just a few weeks, you can be left with bare spots, and bare spots create the conditions for weeds to take hold and grow. Fall leaves create habitat for good bugs and critters, but they also create habitat for snails and slugs to lay eggs. Slugs are infamous for eating hostas and other beloved plants. Where do you stand on the great leaf debate? Log in to Facebook below and let us know your thoughts!